Alameda made a little history of its own yesterday. 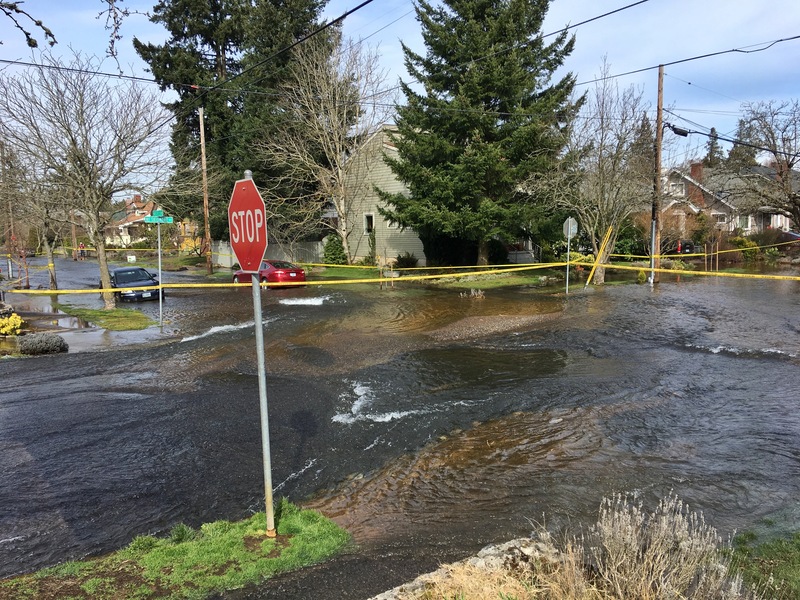 A 30-inch water main–one of the biggies of Portland’s arterial system–ruptured Saturday morning, March 16th along Skidmore just east of NE 23rd spewing more than a million gallons of water a minute through a new gaping hole and dozens of fissures in the pavement. Looking west toward the intersection of NE 24th and Skidmore. Fractures in the street can be seen beyond the parked cars. Saturday, March 16, 2019. Like an urban white-water obstacle course, our new river poured down Skidmore and around the corner at NE 24th on its way north toward the Columbia, washing the bottoms of cars parked along curbs and, unfortunately, spilling into more than a few below-grade garages in the area. Neighbors tracked the fast-moving giant amoeba of water on Twitter as it approached, swamped and then closed several businesses on Alberta. 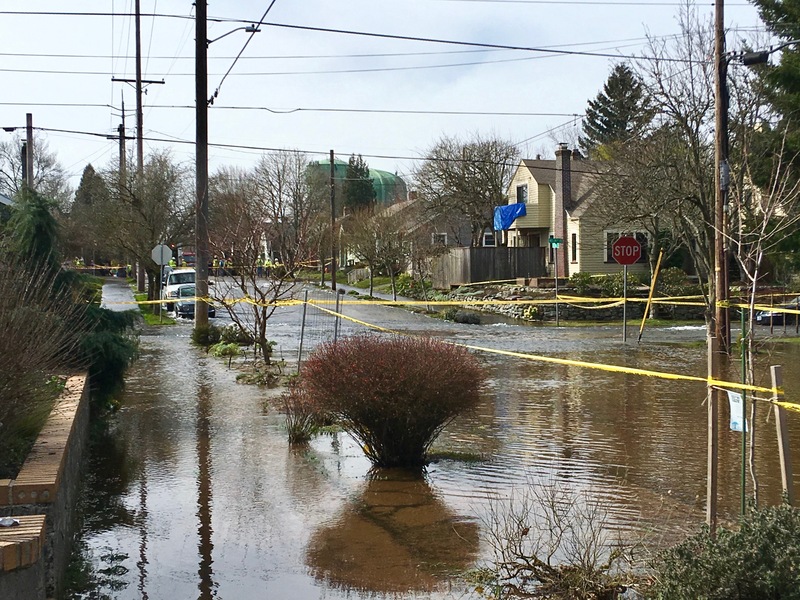 A few minutes later the flood had worked its way down the gentle slope to Killingsworth. For most of the day, water flowed forth, rearranging the streetscape, making fresh cracks here and there and, producing a gravel bar in the middle of the intersection of NE 24th and Skidmore. Gravel bars forming in the middle of the intersection at NE 24th and Skidmore. Saturday, March 16, 2019. Emergency response was fast, with sand and sandbags strategically located almost immediately. First responders from police, fire and water bureaus and the power and gas companies were on it right away. Power was shut off to the neighborhood. And because it was the first sunny warm day of the season, neighbors came out of hibernation to visit. The Neighborhood Emergency Teams were out in the reflective vests to answer questions and add neighborliness. Inside the houses, screens and routers were dark, which no doubt encouraged people to get outside as well. Even Mayor Wheeler and Commissioner Hardesty dropped by to take a look. People stood around and talked, gawked and wondered. Some helped out others with flood clean-up. A few tailgate-type impromptus formed on front lawns that offered good views. Clearly there was loss and damage at the personal and civic level; the re-plumbing and re-paving costs are probably going to sting a bit. But at least among the neighbors we talked with, there was a reminder that we all live pretty close to each other–despite what might feel like anonymity and distance–and that we’re all connected by the same power, the same water, the same streets, and if we allow ourselves (or if we need to), with each other. Of course, we kept thinking about what we know is buried beneath the surface of our streets, and the 1930s photos of a major plumbing disaster quite close to this intersection. Seeing the new gravel bars forming in a few places, we also wondered about the old gravel pits in the vicinity, filled in more than 100 years ago. By this morning, the power is back on, the tap water appears pretty clear (though we’re still drinking from our disaster water stash for now), and the clean-up has begun.